Matt Lucas has obtained undisclosed damages and an apology over an article in the Daily Mail after the death of his former civil partner Kevin McGee. The Little Britain star said the piece, published in March, had impinged upon his grief and invaded his privacy. The 36-year-old comic actor said in a statement the Mail's reporting had been "intrusive and defamatory". He added: "I had no choice but to bring these proceedings to protect my private life and my right to grieve in peace." The entertainer said he took "no pleasure or sense of triumph" from the settlement and was "just relieved" the matter had been resolved. Lucas and McGee had a civil partnership between 2006 and 2008. Kevin McGee committed suicide in October 2009. 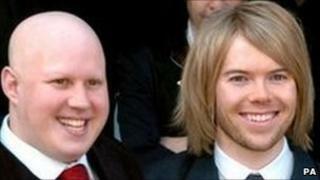 According to law firm Schillings, the Mail's article - entitled How Matt Lucas Learnt to Laugh Again - contained a number of false allegations and had caused the star "considerable upset and distress". Lucas accepted damages from the Daily Star in March for its reporting of his private life.